Odetta Holmes, known as Odetta, was an American singer, actress, guitarist, songwriter, and a human rights activist, often referred to as "The Voice of the Civil Rights Movement". Her musical repertoire consisted largely of American folk music, blues, jazz, and spirituals. An important figure in the American folk music revival of the 1950s and 1960s, she was influential to many of the key figures of the folk-revival of that time, including Bob Dylan, Joan Baez, Mavis Staples, and Janis Joplin. Time included her song, "Take This Hammer", on its list of the All-Time 100 Songs, stating that "Rosa Parks was her No. 1 fan, and Martin Luther King Jr. called her the queen of American folk music." The name Odetta is probably unfamiliar to most people in the generation raised on MTV, yet she is one of the pillars of twentieth-century music. A folksinger distinguished by the power and clarity of her voice as well as the richness and intensity of her delivery, Odetta has also functioned as a living archive of music. By tirelessly researching, recording, and touring, and drawing on a variety of musical genres, she has kept alive the legacy of early folk and blues singers, including Bessie Smith and Leadbelly. Odetta has had a significant influence on modern music, providing inspiration for such performers as Janis Joplin and Joan Armatrading. The singer was born Odetta Holmes on December 31, 1930, in Alabama. Her father died when she was quite young, and her mother remarried, giving the children their stepfather's surname, Felious, and moving the family to Los Angeles when Odetta was six. The youngster took piano and voice lessons and by the time she entered secondary school, she was beginning to discover her immense talent as a singer. She was the star of her high school glee club and, at the age of 14, began singing at the Turnabout Theater in Hollywood. Odetta appeared to be headed for a career as a concert singer until some friends she met while studying music at Los Angeles City College introduced her to the embryonic modern folk music scene. In 1949 she began gigging in West Coast clubs as a solo act, accompanying herself on guitar. Early in her career, she purchased a wood-bodied guitar nicknamed "Baby," on which she did all of her arrangements for years. While she has never considered herself a proficient guitarist, she did in time develop a unique sound that was eventually canonized in the folk music world as "the Odetta strum." Within five years, Odetta had built up a considerable reputation for herself on the West Coast. By the mid- to late 1950s, the singer was touring the United States and Canada; by 1961, she had played Carnegie Hall and appeared twice at the renowned Newport Folk Festival. Odetta was unquestionably one of the brightest stars of the folk music renaissance of the early 1960s, which also saw the first of many world tours for her. Reaching much of mainstream America through the medium of television as well, Odetta received acclaim for her appearance on a musical special with musician Harry Belafonte and stole the show from an impressive roster of singers in the 1963 program Dinner With the President. She also performed as an actress in several films and television programs, most notably The Autobiography of Miss Jane Pittman and the movie version of American novelist William Faulkner's Sanctuary. 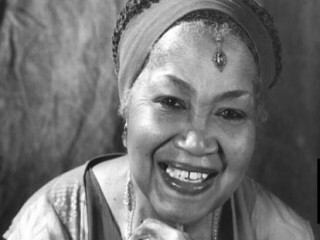 Odetta's unique and amalgamated style ensured her popularity beyond the 1950s and 1960s. In the New York Times Jon Peeples described the singer's performance in Merkin Concert Hall's 1989 Voices of Change series: "She strung together blues and spirituals, many of them unfamiliar. Over the steady rhythm of her guitar and her tapping foot, she sent her voice to its clear heights and its nasal depths, bringing out the field holler roots of her music." The musician has noted that her choice of material at a particular concert depends largely on her perception of the audience, and she prefers solo performances since they allow her the freedom to sing what she feels like singing. Odetta's vocals along with her self-acquired knowledge of the guitar combine to create a dramatic effect. "I'll play the same few chords," she pointed out to Robert Yelin in Frets Magazine, "but by varying my strumming, by harmonizing notes within a chord and picking some other notes--that way I'll achieve the sounds of fullness. I love the opposite forces I can create by singing a smooth melody line and hearing my rhythm playing churning away beneath it. I love those dramatics in music." Often shunning the strict tenets of folk purists, Odetta explained her reason for employing numerous techniques in her performances, as quoted by Yelin: "If a song is important enough for me to sing, I'll find a way to accompany myself on guitar. I would make up chords to fit the singing--I'm not a purist in any way, shape, or form. If I felt I needed to sing a song so badly, and I couldn't play accompaniment for it, I would sing it a capella." One of Odetta's most notable traits is her limitless curiosity about music. In addition to demonstrating a scholarly tenacity in researching traditional forms--usually at the Library of Congress in Washington, D.C.--she has always been willing to try new styles. Accordingly, she has performed with such partners as musicians Count Basie and Bob Dylan and writer Langston Hughes and in various genres, including blues and gospel. Odetta's versatility is demonstrated in her versions of the spirituals "Hold On" and "Ain't No Grave Can Hold Me Down," her a capella arrangement of "God's a-goin' to Cut You Down," her heartrending rendition of "All the Pretty Little Horses," which evokes the injustice of plantation life in the American South, and her performance of the prison song "Been in the Pen." Whether standing in front of a symphony orchestra or alone with her guitar, Odetta is a commanding presence on stage. Her fans claim that the best of her recordings--most of which are out of print--fall far short of capturing the impact of her live performances. In the liner notes to Odetta Sings the Blues, critic Adam Barnes described her as "a large and significant voice that can swell with majesty, phrase delicately, dipping deep into the bottomless well of song." The 2005 documentary film No Direction Home, directed by Martin Scorsese, highlights her musical influence on Bob Dylan, the subject of the documentary. The film contains an archive clip of Odetta performing "Waterboy" on TV in 1959, and we also hear Odetta's songs "Mule Skinner Blues" and "No More Auction Block for Me". In 2006, Odetta opened shows for jazz vocalist Madeleine Peyroux, and in 2006 she toured the US, Canada, and Europe accompanied by her pianist, which included being presented by the US Embassy in Latvia as the keynote speaker at a Human Rights conference, and also in a concert in Riga's historic 1,000 year old Maza Guild Hall. In December, 2006, the Winnipeg Folk Festival honored Odetta with their "Lifetime Achievement Award." In February, 2007, The International Folk Alliance awarded Odetta as "Traditional Folk Artist of the Year." In 2007, her album Gonna Let It Shine was nominated for a Grammy, and she completed a major Fall Concert Tour in the "Songs of Spirit" show, which included artists from all over the world. She toured around North America in late 2006 and early 2007 to support this CD. On December 2, 2008, Odetta died from heart disease in New York City. -My Eyes Have Seen 1959. -Sometimes I Feel Like Crying , RCA, 1962. -Odetta at Town Hall 1962. -Odetta Sings Folk Songs RCA, 1963. -One Grain of Sand 1963. -Odetta at the Gate of Horn Tradition. -Odetta at Carnegie Hall 1967. -Odetta Sings the Blues Riverside, 1968. -The Essential Odetta Vanguard, 1973. -Movin' It On Rose Quartz, 1987. -Odetta and the Blues Fantasy Original Blues Classics, 1992.